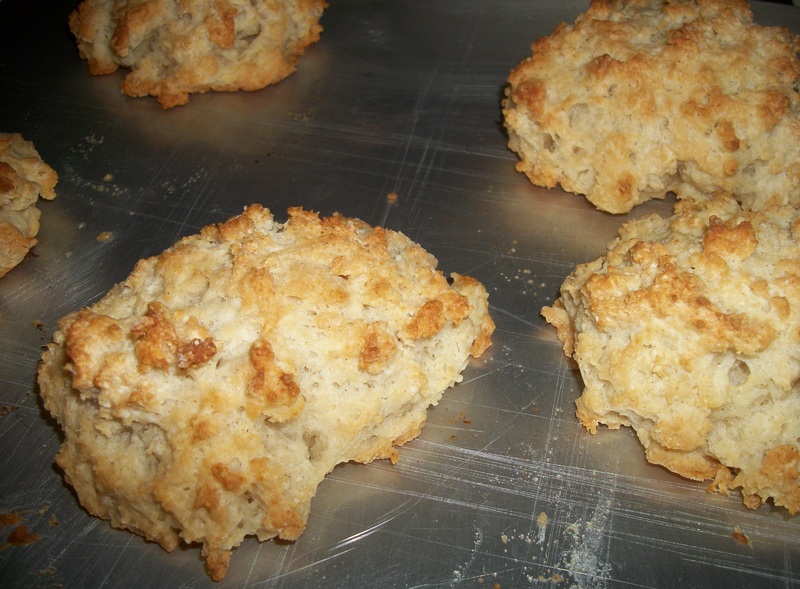 Oh my, oh my, what splendid texture these biscuits have! Golden brown and crisp on the bottom and top, and soft and moist in the middle! I decided I needed to type up this recipe before I forgot what I did! Combine all the starches, flours, baking powder, salt, and xanthan gum. Whisk together to blend well. Add the butter and cut it into the mixture with a pastry cutter, until it resembles coarse crumbs. Add the milk and vinegar mixture, and mix only until the mixture is moist. Scoop the dough onto the cookie sheet, dividing it into 8 equal scoops. This is messy if you try to do it by hand, so you may want to use a spatula or large spoon sprayed with cooking spray. Cook for 20 – 25 minutes, or until the biscuits are nicely browned. What made these great (in my opinion) is their wonderful texture. 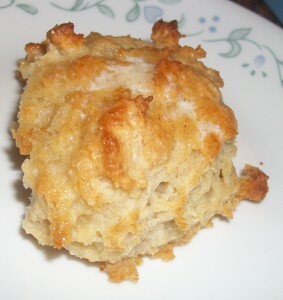 Like any gluten free bread/pastry, they don’t have quite as much flavor as the gluten alternative, but slather some butter, honey, jam, or maybe even cinnamon sugar on these, and you’ve got something wonderful! Decrease the temperature to 350, and cook for 45 – 50 minutes, watching for the crackers to get crisp. The resulting cracker is mildly sweet and flavorful.